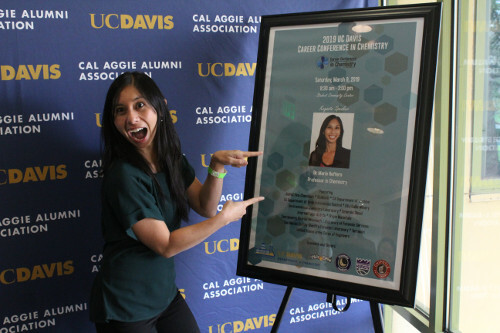 On Saturday, March 9, the Department of Chemistry at UC Davis hosted another successful career conference despite the inclement weather— neither rain, sleet, nor snow would dampen the mission of the conference or the spirits of its attendees. The Fourth Annual Career Conference in Chemistry was an event that provided chemistry majors an opportunity to learn from job recruiters and representatives about developing skills for entering their post-graduate careers. In addition, it provided the opportunity for invited companies and organizations to meet one-on-one with undergraduate chemistry students to learn about their career goals. This annual event is co-sponsored by the ACS Sacramento Chapter and ACS Chemistry Club at UC Davis. The conference began bright and early with keynote speaker, Dr. Marie Heffern, a professor in the UC Davis Department of Chemistry. She specializes in bioinorganic research, and spoke about her path to professorship as well as her recent experiences as one of the department’s newer professors. Following the keynote introduction, the event featured a panel of recent UC Davis alumni who have all carved out unique and different careers for themselves in the industry, or are planning on returning to school for a Master’s or Doctorate degree. One speaker, Teresa Huang, is currently working on her Master’s in Teaching with the UC Davis School of Education, and is currently teaching chemistry to high schoolers at NP3 High School in Natomas, California. After the alumni panel, representatives from various industry companies provided their insight on the qualities and attributes that they look for when hiring new employees. Featured panelists included John Esparza (US Army Corps of Engineers), Keith Herron (Target Excellence), Khevna Desai (Emerald Cloud), and Huy Nguyen (Genentech). 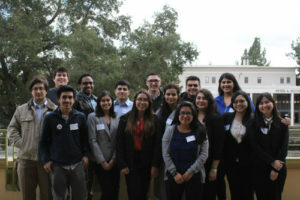 Although the career conference was primarily geared towards UC Davis students, there were various other schools represented as well. Students from UC Merced, Modesto Community College, Sacramento State, and Merced Community College were able to gain some experience and insight into their own career aspirations for students following a Bachelor’s in chemistry. 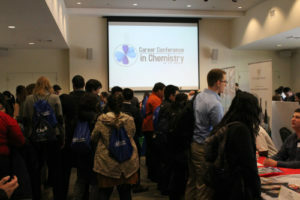 The Career Conference in Chemistry has grown throughout the years. 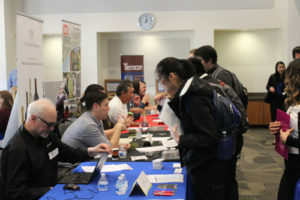 This year, there were over 130 student attendees, and over 20 companies and organizations at the event’s afternoon tabling session. Companies such as Genentech, E&J Gallo Winery, Emerald Cloud, and BioMarin were returning companies, and many of these representatives were impressed by the growth and progress of this event. Students and representatives alike agreed that this event far exceeded the capacity of the UC Davis’ Student Community Center, and in response, the planning committee is already searching for a larger venue for the upcoming years. 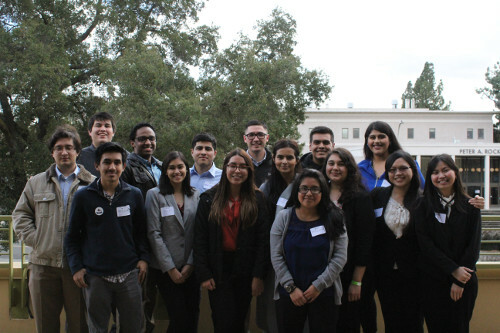 The 2018-19 Conference Planning Committee would like to again thank our sponsors and donors for their generous support of our event: UC Davis Department of Chemistry, ACS Sacramento Chapter, ACS Chemistry Club at UC Davis, Chipotle Mexican Grill, Insomnia Cookies, Philz Coffee, and The Sacramento Kings. Also, special thanks to all of our panelists, company representatives, volunteers, and especially the students who attended.